First, are the millions of aging Americans preparing for the financial cost of entering into skilled nursing facilities? As Rosenblatt points out, many seniors and their families are surprised to learn that the Medicare program does not cover custodial care—the specific care that many individuals require when they enter a center. Without Medicare, families are left to pay for the skilled nursing care on their own, a cost that in recent years has reached about $70,000.00 annually. These costs can be overwhelming to families and individuals, who are already faced with an emotional decision. Providers may be part of these difficult conversations—for tips on how to handle these situations and to help families navigate through their financial and emotional concerns, visit Care Conversations.org. Second, how long will the LTC community be able to sustain the ever-increasing demands on their providers and caregivers? Many facilities across the nation are surviving because of the dedication of their caregivers and the selflessness of unpaid community volunteers. But with the Boomers nearing retirement age, SNFs and assisted living facilities will be strained to cover costs with reduced government funding, and volunteers will become even more essential. As Rosenblatt poignantly asks: Will there be enough of these loving volunteers in the future to care for the growing legions of aging boomers? Check out the full LA times article here. 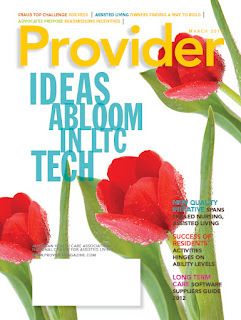 Provider's March cover story examines how long term care and post-acute care facilities are brainstorming like never before. Using new technology and innovations for improving care and cutting costs, providers across the country are preparing for the new age of coordinated care and bundled payment programs. The article highlights a number of providers, focusing a lot of attention on the work being done by the Good Samaritan Society, based in Sioux Falls, South Dakota. At Good Sam, innovation is more than a passing fancy, it's part of the organization’s lifeblood as the provider seeks new business opportunities and fresh ideas on how to care for its residents now and into the future. Sometimes the innovation is a new technology, like an electronic health record or sensor system, but other times it is actually a low-tech solution, coming in the form of tweaking existing practices, possibly involving staffing or how residents are cared for on a daily basis. One technology featured in the article is the software offered by OnShift to allow providers to manage labor costs and please staff at the same time. Instead of the old way of filling open shifts, the software gives administrators tools to communicate with staff efficiently to discover the best candidate for open shifts without running unnecessary overtime that busts facility budgets. Long term care has a reputation as being behind the times when it comes to using technology seen in other care settings. This month we explain how and why that stereotype is being broken down, one facility and one innovation at a time. Get the full story beginning on page 25 of the March issue. The Cabinet hit the ground running this week with the unveiling of the Initiative’s four strategic quality improvement goals for the long term and post-acute care community during the AHCA/NCAL Quality Symposium in Houston, Texas. In addition these goals, the Cabinet will also tackle a fifth goal to develop new therapy outcome measures, a national effort in partnership with other leading long term care organizations. 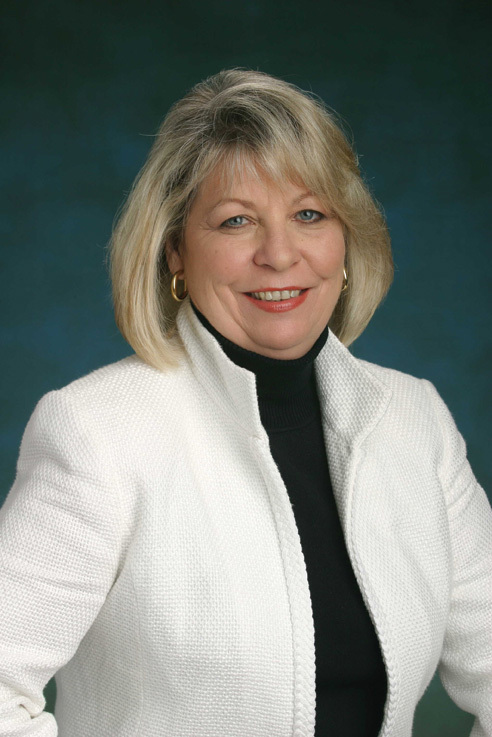 The Cabinet is headed up by long time quality champion Mary Ousley, who received the Association’s “Friend of Quality” award last October at the AHCA/NCAL Convention in Las Vegas. Recognizing Ousley’s outstanding work in quality improvement, AHCA/NCAL renamed that award to the Mary K. Ousley Champion of Quality Award. Read more about the work ahead for the Quality Cabinet in the March issue of Provider Magazine. You can’t hit a target if you don’t know what it is. At least that’s what Anthony Robbins, famed life and personal development coach said in his best-selling book, Unlimited Power. While this may phrase may sound like common knowledge to some, it’s a great reminder of the importance of not only setting measureable goals, but sharing them with others. Apply this concept to the long term care world, and you have AHCA/NCAL’s new Quality Initiative. 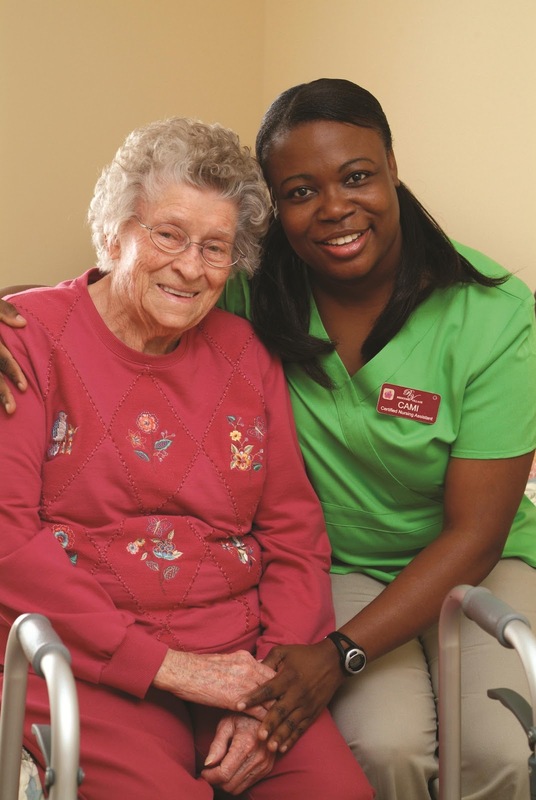 While individual skilled nursing centers and assisted living communities already have quality advancement programs in place, The Initiative is a collective effort by the long term and post-acute care community to aggregate that work into a larger context. • Reduce Hospital Readmissions: By March 2015, reduce the number of hospital readmissions within 30 days during a SNF stay by 15 percent. • Increase Staff Stability: By March 2015, reduce turnover among nursing staff (RN, LPN/LVN, CNA) by 15 percent. • Increase Customer Satisfaction: By March 2015, increase the number of customers who would recommend the facility to others up to 90 percent. • Reduce the Off-Label Use of Antipsychotics: By December 2012, reduce the off-label use of antipsychotic drugs by 15 percent. While the Initiative is just getting started (announced this week at the AHCA/NCAL Quality Symposium), AHCA/NCAL members already have a number of tools at their fingertips, including LTC Trend Tracker and the Quality Award Program. Read more about the AHCA/NCAL Quality Initiative on page 38 in the March edition of Provider, or check it out online. A great opinion piece* ran today in Politico Pro on the dangers of Medicaid and Medicare cuts to the nation’s nursing homes. As the authors point out, Medicare funding for nursing homes is set to be reduced by over $125 billion over the next decade, and a number of states suffer from a national Medicaid shortfall. While the profession has made great strides in quality and staff retention, cuts to these critical funding streams jeopardize further enhancements and threaten staff stability of the nation’s 10th largest employer. AHCA members know that we have struggled to absorb rounds of reductions at the state and federal level and we truly are at a tipping point. That’s why it’s critical to consistently make sure our lawmakers know this too. Everyone knows the effects a disaster can have on a community. The devastation from the Joplin, Missouri tornados last year is a stark reminder of just how important it is to be prepared. 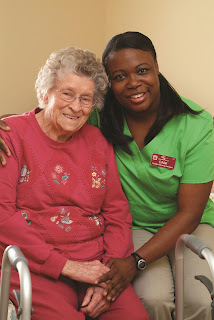 When it comes to nursing home and assisted living residents, however, facility staff and first responders face even greater challenges to have protocols in place and carry out them out effectively. So it’s timely that the AHCA Disaster Planning Committee met in Washington D.C. yesterday to discuss just that. Getting an early start on hurricane season, the committee had a full agenda that highlighted everything from best practices for electronic resident identification to reimbursement issues for disaster expenses to developing guidance and tools for ethical issues, power supply and more. The Committee also heard from Kristen Finne of the Office of the Assistant Secretary for Preparedness and Response for the Department of Health and Human Services, on building a health care coalition with long term and post-acute care providers at the regional level. This year the Committee is promoting its Nursing Home Incident Command project, which enhances communication between facility staff and first responders. Hear more about the project from Tim Graves, president of the Texas Health Care Association and chair of the Disaster Planning Committee. The days of limited job opportunities are numbered for the health care industry, according to a Bureau of Labor Statistics (BLS) report issued last week. The report shows that health care— and the area of long term and post-acute care in particular—is one of the top five sectors flagged to grow steadily in the next decade. Check out AHCA/NCAL’s bookstore for more resources on developing your staffs' careers in the health care industry. In case you haven’t heard, AHCA has introduced a plan to reduce the number of readmissions to hospitals for nursing home patients. The plan is designed to incentivize skilled care centers to reduce readmissions via a goal that would result in $2 billion in Medicare savings. In a tough economic climate where proposals to cut Medicare and Medicaid are considered the norm, this proposal couldn’t have come at a better time. But the plan doesn’t just save taxpayer dollars, it also improves quality by encouraging additional coordination of patient care between the hospital and the nursing facility. 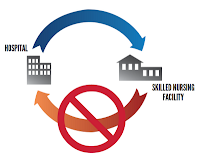 It’s all part of AHCA’s initiative to put skilled nursing care centers front and center as the care and cost solution to high quality, person-centered care for every individual needing long term or post-acute care. Check out these news stories featuring AHCA’s plan to generate Medicare savings. You can also read more about it in our one-pager. Think that long term care is behind the times when it comes to technology? Think again. The Evangelical Lutheran Good Samaritan Society recently contradicted that notion when it hosted U.S. Representative Kristi Noem (R-SD) at their assisted living residences at the Society's national campus in Sioux Falls, South Dakota. Along with a tour and discussion with the residents throughout the facility, Rep. Noem got a firsthand look at the company’s new technology system that they credit with improving satisfaction for residents, their family, and friends. Find out more about the visit and Good Samaritan’s technology initiative in their facility tour video. For the full story, be sure to check out the upcoming March edition of Provider Magazine.